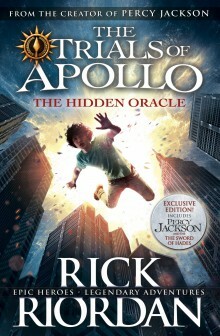 From the pen of Rick Riordan, famous for his 'Percy Jackson and the Olympians series' comes this new offering: The Hidden Oracle. I purchased the Australian trade paper version for my 9 year old son because he loved reading the Percy Jackson series. I'm happy that he's getting some exposure to Greek/Roman Mythology, even if it's from a second hand source, but at least he's reading and enjoying the story. So maybe it will make him more open to the classics in the future. OK, so hopefully that gets you interested. I'll ask him to provide further info if he finishes the book. Or just visit your local bookstore or library, they're sure to have a copy it's a number one best seller after all. After angering his father Zeus, the god Apollo is cast down from Olympus. Weak and disoriented, he lands in New York City as a regular teenage boy. Now, without his godly powers, the four-thousand-year-old deity must learn to survive in the modern world until he can somehow find a way to regain Zeus's favour.